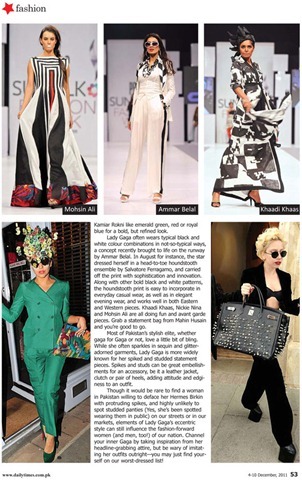 “How To Channel your Inner Lady Gaga while dressing in Pakistan”—Read my Feature in the Daily Times Sunday Magazine! By now, you all must know how much I love to discuss Lady Gaga when I write about how fashion trends in the West translate into style in the East. A few months ago, I wrote a feature about her “Little Monsters” in Dubai for Gulf News tabloid, and this week, my piece about her fashion influence in Pakistan was published in Sunday Magazine, Pakistan’s weekly fashion magazine, distributed with the Daily Times newspaper.